This poem was published around this time last year. I didn’t really like how it ended, but never got around to tinkering with it, so I will put it out as it is. I love the old legends and stories of this country. Spring Heeled Jack was a sensation back in the 1800’s-showing up all over the show, but is largely forgotten now. I never knew though that his appearances have allegedly continued into modern times. 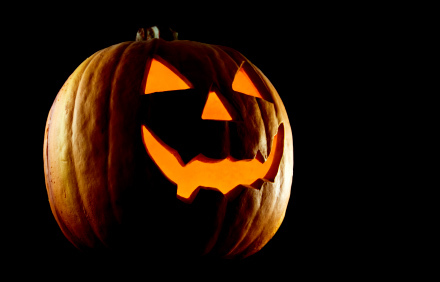 With Halloween just around the corner I thought I would share with you the legend of Spring Heeled Jack who was once infamous in Victorian times and yet is now largely forgotten. Early 19th Century London was a spooky and often dangerous place to be after dark and ghosts were often reported to follow and prey on lone travellers, sometimes even assaulting them. Of these the most prominent was The Hammersmith Ghost who seems to have been active for at least 20 years. 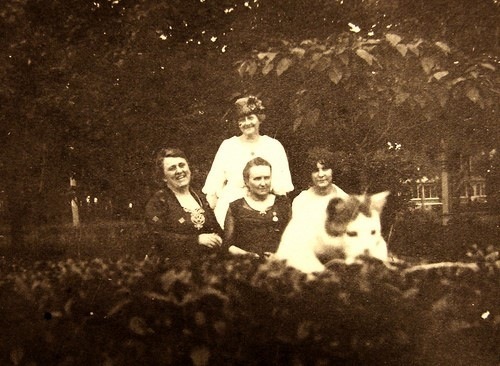 While the feeling is that the term ‘photobombing’, along with the very inconsiderate act itself, is a modern phenomenon, we can see from this photograph that even our ancestors had to contend with annoying last-second gatecrashers. Especially of the feline variety. They are always the worst-all stealth and false smiles. Bit like my wife on our wedding day.And did I mention claws? A couple of this ensemble are attempting to laugh it off, but the lady in the center looks well pissed off. Always the cat, always the focus. Have a great weekend, you who sit quietly in the background, and you who hog all the limelight. And especially you cats-my most fanatical of followers. Photograph from Find My Past UK. My love of old photographs has been well documented before on City Jackdaw. Indulging myself recently, I thought I would look for some of the earliest ones that I could find, some of which I now share with you. Any technical information you need you will have to google search for- the specifics are beyond me. I just appreciate them because of their significance and age. 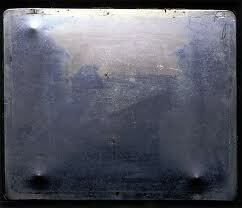 The following photograph is the earliest surviving camera photograph, from around 1826. 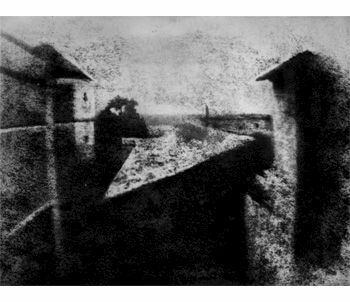 By Joseph Nicéphore Niépce, View from the Window at Le Gras. Not much chance of spotting a photobomber here is there? Here is an enhanced version. What about the first photograph of a human? 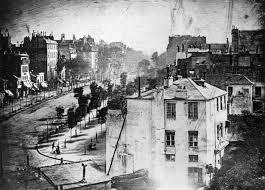 ‘Boulevard du Temple’ by Louis Daguerre, in 1838, is generally accepted as the earliest photograph of people. Taken of a busy street, the exposure time was at least ten minutes, so the moving traffic left no trace.  Only the two men near the bottom left corner, one having his shoes polished by the other, stayed in one place long enough to be visible in the photograph. It is most likely that these two faceless, unknown people lived out the rest of their lives and died unaware of the role in history that they played. 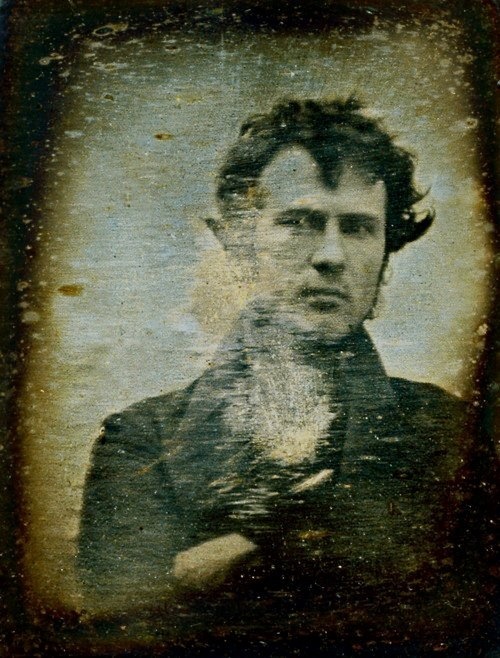 I know in the past I did a post entitled ‘A Sense of Absence.’ .https://cityjackdaw.wordpress.com/2013/04/30/a-sense-of-absence/ In that I talked about how I was haunted by old photographs, by the absence of resolution I felt when I looked upon the people in them, never knowing who they were, and what became of them. For some reason this picture here had the opposite effect. Discovering the man’s name somehow lessened the image. Until I discovered the facts surrounding it, I was intrigued by this imposing, (then) mystery figure. He appears in equal measure part Byron/part Time Lord/part vampire. 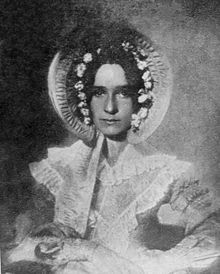 This beautiful woman below is the subject of one of the oldest photographic portraits, made by Joseph Draper of New York in 1839 or 1840 of his sister, Anna Katherine Draper. Both demure and elegant, maybe a proto-type Elizabeth Taylor. Following on from that is this last photograph, from around 1900. 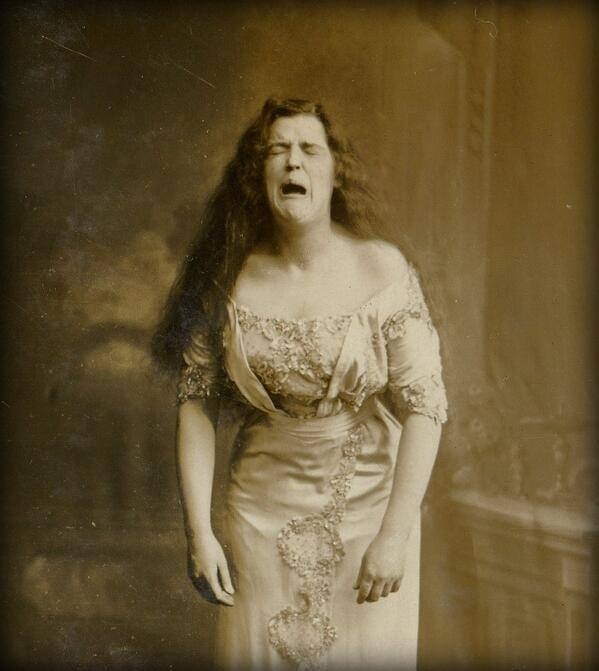 It is one of the earliest photographs of someone caught sneezing. It goes to show that you can wear all the fine lace to accentuate your air and grace that you want, but in that moment of nasal tickling helplessness you look just as ridiculous and undignified as the rest of us commoners do. There was a poor Scottish farmer by the name of Fleming, who, while out trying to make a living for his family, heard someone crying for help from a nearby bog. He dropped everything and ran to where he thought the cry was originating from. In the bog he discovered a terrified boy, stuck to the waist, struggling desperately and screaming. Fleming saved the boy from a horrible and certain death. A day later, a posh carriage turned up looking out of place in the sparse surroundings of the farmer’s land. A well dressed nobleman emerged, introducing himself as the father of the boy he had saved the previous day, saying he wanted to repay the farmer for saving his son’s life. Fleming refused, saying he could not accept payment for what he had done. And that is what happened. In time, Fleming’s son graduated from St.Mary’s Hospital Medical School in London, going on to become known throughout the world as the noted Sir Alexander Fleming, discoverer of Penicillin. Years later, the nobleman’s son was stricken with pneumonia. What do you think saved him? That’s right-Penicillin. What was the name of the nobleman? Lord Randolph Churchill. His son’s name? Sir Winston Churchill. Sometimes you can see this process in action in a more identifiable way than a deposit in a cosmic or spiritual bank account. The next time I am feeling all self-absorbed and caught up in my own self-importance, revelling in a world that revolves around me, I shall think of this photograph. 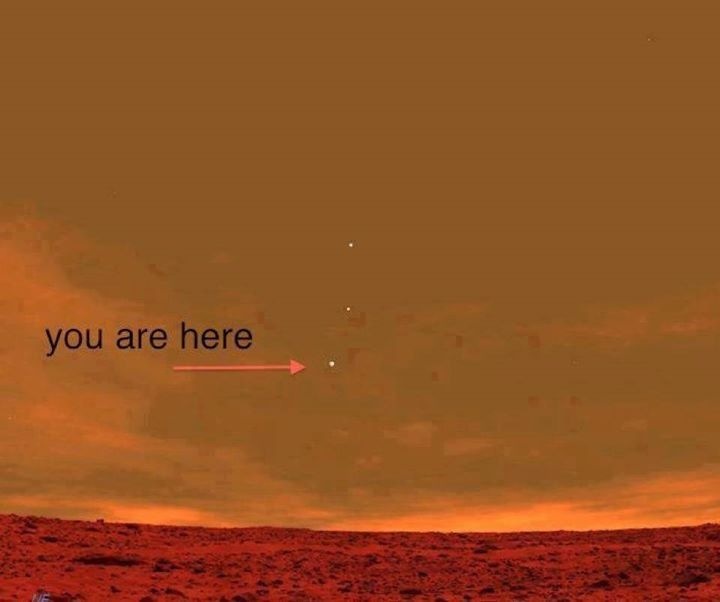 Purported to be an actual image taken from the Martian surface by NASA’s Rover, I have been persuaded that this is actually fake. But still, you get a sense of scale, along with a healthy dose of perspective. In space, no one can hear you preen. Have a great weekend, whatever planet you are on. A while back I read Fahrenheit 451 by Ray Bradbury. It was one of those books I had always meant to read, but it took me forever to get around to doing so. Although her presence in the book is but brief, I loved the way that Clarisse McClellan viewed the world. In a society stripped of imagination and wonder, her joy for life filled the pages in which she featured, showing an interest and love for nature rather than technology. The way she smelt old leaves, tasted the rain, left flowers on the porch for the main character, Guy Montag. In a sterile life devoid of books, creative thinking, imagination and poetry, Clarisse stood out. Is this what sets us apart? The appreciation of art, and of beauty? And how, above all other species, our imagination can envisage something different, something better, and so we keep on striving, never settling for what we have. Living a life of aesthetic vision. The burning of the books reminded me of course of the nazi book burning rallies, but on a greater, all encompassing scale. As writers, and readers, just what would we do in a world without books? How would we, could we, express ourselves? From this destructive, censoring burning, my thoughts turned towards another type of burning. In the thinking of the Celts, the act of being inspired, of attaining that spark of inspiration, of connection, was known as the fire in the head. The former refers to flames that destroy, the latter to flames that create. The way that our inner workings, thoughts and dreams are creatively given form, substance. How they are brought from the darkness into the light. How they are realised in a world that is dependent on sensory affirmations. Our interior lives, our interior presence, dwarfs our outer expressions. Each of us carries whole worlds within us that barely escape into the light. In Bradbury’s story, although the world has been expunged of physical books, they still existed within the minds and memories of those drifters, those dreamers in exile, who were keeping them safe in the silent sanctuary of their being until the time comes for them to bring them forth once more to plant in a more receptive, welcoming and fertile ground. As one of those characters says towards the end of the novel, they, we, are but the dust jackets of whole created worlds, worlds that turn to the rhythm of words and of metre, that inform and inspire and move us. Is it the appreciation of art, and of beauty, that sets us apart?